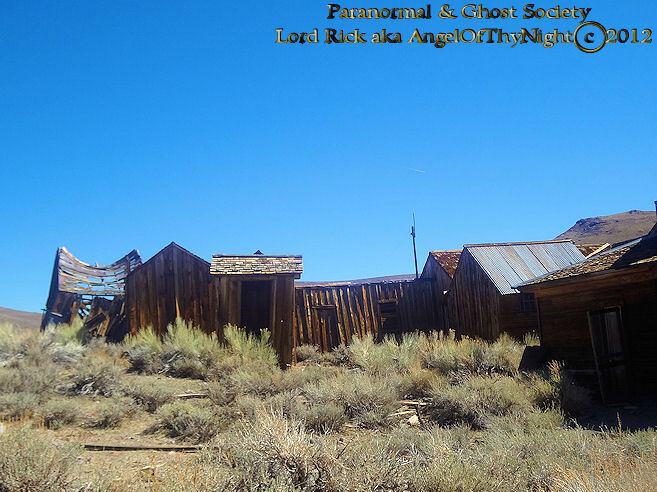 I first learned about Bodie back in 2001 when The Paranormal & Ghost Society opened its doors. At the time I was residing in Buffalo NY so little did I know that one day I would be walking the streets of Bodie in search of its ghosts. I also didnt realize that some day Bodie would be my 1000th Investigation/exploration. Technically speaking this milestone has put us up their with one of the top paranormal groups in the world. When I first opened our organization I realized that the east coast had ghost towns but not of the same magnitude that Bodie presents. Bodie may be one of the largest and most well preserved ghost towns in the country despite that only five percent of it exist today. Not only was it one of the wildest towns in the west but one of the richest. The history, tragedy, tales and series of haunting's go far beyond any other ghost town that I have ever visited. As you can see we worked quite hard on our photos to make this section of our site stellar for our visitors. 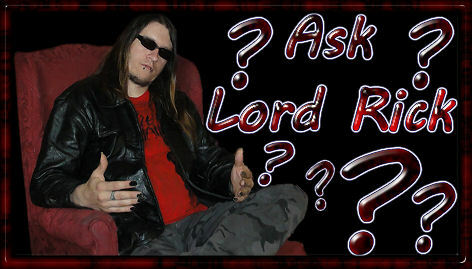 Were not a paranormal site that just throws up a few dust photos and says we caught ghost. This section of our site is special hence all the extra work we put into Bodie. We want others to learn but to have fun doing it so when you browse our Bodie pages try to absorb the history by viewing all our content as we want you to feel that you are a part of our journey. 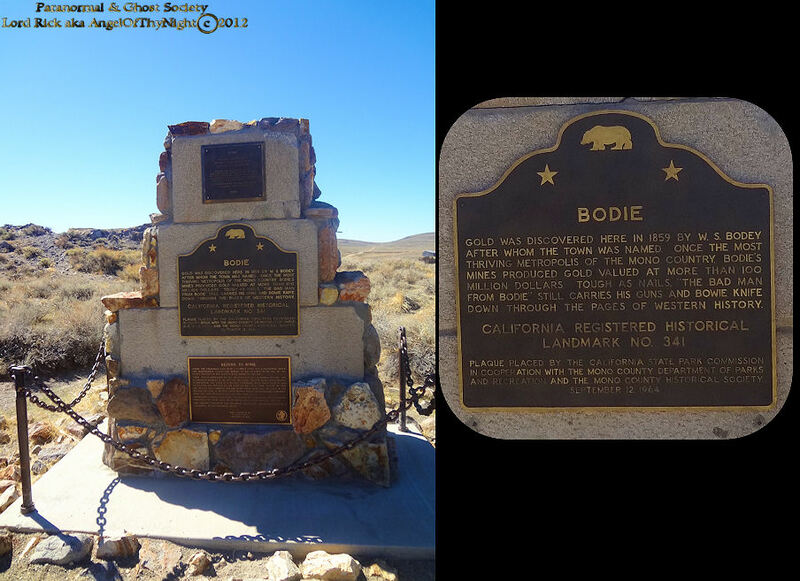 How did Bodie get its name some of you may wonder? Well one of the first mining camps called Dogtown near Monoville the town which began east of the Sierras. Gold was discovered here and it grew into a fairly good sized community. Despite its boom when the first winter came nearly three quarters of its residences left the region abandoning their businesses and homes. This would leave the town dwindling but also set the tone for what we refer to as a ghost town as generally most miners would move on. This fact might be based on harsh weather or if they just were not making enough profits. Their was gold in these hills all throughout Nevada, Utah, Arizona and California while some struck it rich others were doomed. When someone drank a bit to much they would tell stories of gold and thus it would create gold fever like with Dogtown. This led to miners being dispersed to various regions and the growth of various towns just as with Bodie becoming the boomtown that it was. It all started in 1859 a man by the name of W.S. Bodey/Body from Poughkeepsie NY who came to a mining camp known as Monoville near Mono Lake. Some say the man was named William others say Wakeman. Anyhow, Bodey explored the hills which surround the ghost town today where he found rich Placer gold. I guess that back in the day prospectors traveled around allot in hopes to find their own claims. Unfortunately some of those prospectors died while trying to strike it rich while some led some fairly wealthy lives. Bodey was led to a tragic end as camp was 15 miles from the nearest community. Apparently this was the case when four prospectors who discovered Gold in what is known today as the Bodie Mining District today when word had gotten out. Unfortunately W.S. Bodey died in a snow storm while trying to make his way back to camp from Monoville with supplies. His best friend named "Black" Taylor went out into the storm looking for him however it was a no go as the whiteout made visibility impossible and by May when the snow thawed he found his bones burying him in a shallow grave. The gold in the Bodie hills had rest at over 8,000' and the winters were some of the harshest in the country. When word came out about Bodey's finds its brought others to the region to form a mining district like some sort of legend. Apparently this district had stables and a painter who mispelled Bodey's name put up a sign above it called "Bodie Stables"! Nobody thought much of it thus that name was accepted as W.S. Bodey also used variations with his name so nobody ever really knew what his real name was as their were many versions printed by historical records and newspapers like the New York Times. However it was Bodey who was accredited with wandering these hills discovering the regions first gold! Perhaps the curse of Bodie began before the town ever began when you start to think about all the little mishaps which led to the growth of this metropolis. About twenty years later a funeral would be held in Bodie to inter the bones in the towns cemetery thus a funeral was held. The locals however made a mistake failing to mark this new grave thus the location has been forgotten. Which makes you wonder why the town is rumored to be cursed perhaps its the ghost or the fact that Bodie grew into a town where some really bad man taunted it. Nearly almost daily fights, robberies, theft, shoot-outs and murder would occur. It seemed to occur on a regular basis as the town was lawless and attracted all sorts of transients. It was a place full of Dance and Gambling Halls. Their was a saloon on every corner and prostitutes were seen everywhere. Many men had wealth which made some very greedy while others were so jealous they led a life of stealing. The town grew to over two thousand structures however due to fires of 1892 and 1932 about %95 of Bodie would be reduced to ashes. This metropolis had a Chinese residential neighborhood, Red light district and Main street was about a mile long. 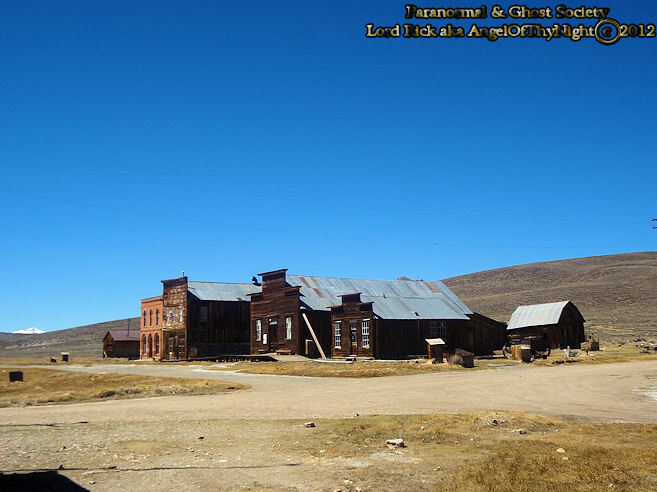 It did not take very long for Bodie to become a boomtown once gold was discovered here. As miners, businessmen, wives, servants, prostitutes, children, tradesmen, gamblers, outlaws and ranchers flooded the region till about the mid 1880s! 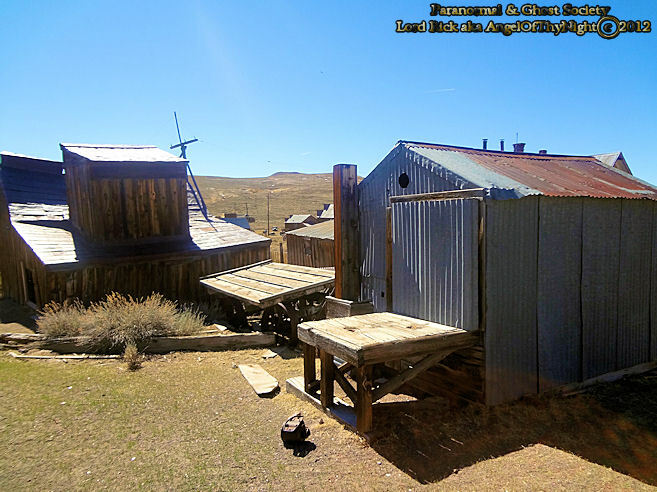 Mining was not exactly that big in Bodie in the 1860's and in the early 1870's as a matter in fact the mining districts first two stamp mills were abandoned. You have to understand that nearby you had other mining towns like Aurora and Masonic which had their own successful mining districts. At the time Bunker Hill shafts were only revealing low-grade quartz veins. However in 187 that would change when a mine called the Bunker Hill Mine caved in revealing an ore body of healthy placer gold. This intrigued a group of capitalist from San Francisco who purchased a claim and organized heavy industrial mining in the area. The Bunker Hill Mine would have its name changed to The Standard Company which would go on to produce over 100 million dollars in gold and silver. Today the Standard Mill still stands at the base of the hill even though it burned down in 1899 it was rebuilt and overshadows the entire town of Bodie. If you visit our Industrial section of these updates you will see the mill which truly made Bodie what it was employing over 500 men at one time. When the company was a success people from all over the country bought stock and wanted to stake their own claims which by 1878 led to a total of twenty two mines. 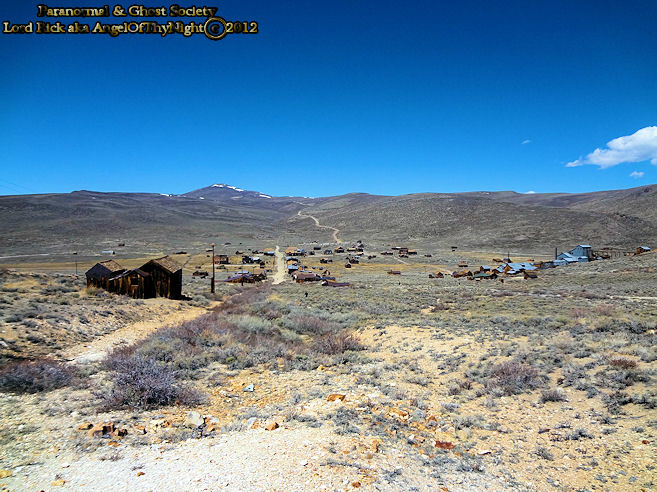 The late 1870's is when Bodie had reached its peak as a boomtown. Although the ore was not of high grade back in the 1860's mining had greatly advanced so by the 1880's investors from NYC and San Francisco could pay to mine at deeper levels which brought out higher grade ore. It was rumored that the Bodies Lode stretched for two miles from Bodie Bluff pass through High Peak and Silver Hill then ending somewhere below the Queen Bee Hill. Due to this factor steam-powered hoisting machery would be brought into town so that the ore could be reached which brought in some of the highest grade gold in the wild west. Bodie became a rich and exciting town to reside in perhaps to exciting as by the later 1870's their were over sixty plus saloons and no churches. The town had Opium Houses and Bordellos where the miners would go to relax. Unfortunately the town attracted many bad men who were full of greed and lust. This would lead to brawls, shootouts, stagecoach holdups and robberies. It was not a pleasant place for children to reside at. When someone was killed or their was a funeral the fire hall bell would toll throughout the town. It was a very depressing scene to reside here not to mention that snow would literally bury buildings being that the town was built at 8'400 east of the Sierras and Yosemite! A steady supply of wood could be brought in to power the mills and warm the houses. The Chinese would bring the wood on in via mules while later came the Bodie-Benton Railroad which brought in a much larger amount of supplies. The town had general stores and hotels generally for about $1.00 a day could get you a room with meals. Main street was full of entertainment so that the miners could relax after working all day long in the depths below the town. Saloons had shows just as the women of Bonanza Street provided the men with all they needed. The Chinese had a town within a town as during this time their was segregation between the whites and other ethnic backgrounds even when it came to burials. They Chinese wanted to continue to practice their own traditions and customs. They more then often came to the town as laborers from China in 1878 to work on the railroad and build many of the homes you see today in Bodie. They would also sell vegetables, produce charcoal and work on the railroad. The Chinese had their own boarding houses, stores, saloons, laundry and gambling houses. They even had their own Taoist Temple! Sadly the boom from about 1878 to about 1881 did not last long although their was as many as over 12,000 residents by this time and over 2,000 structures most of them were abandoned and by 1886 the population dwindled around 1,500 employing about 500 miners surrounding the Standard Mill. Then later on in the 1890s electrical power came to operate the stamp mill and cyanide processing which brought a short lived boom . This would not last long as overtime residents began to clear out as much of the rich ore had been removed and the mines that once held the Placer Gold were depleted. This also goes with the fact that in 1892 a fire threatened most of Main Street and only later in 1932 a 2½ year-old called "Bodie Bill" was blamed for starting a fire that reduced the town to nearly ten percent. This is why kids should never play with matches! Bodie would not die out completely till the 1940's this is when the Cain family sold it to the state of California. 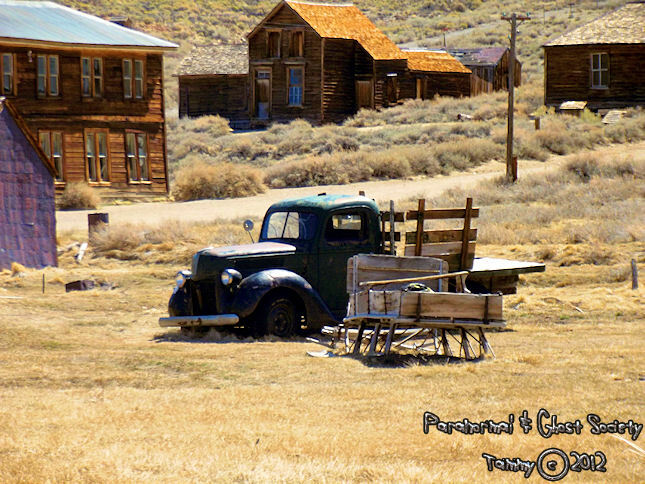 In 1962 a small part of Bodie was designated as a State Historic Park to help preserve its history. At one time all the way up till the 1970's camping was allowed here till the campers began to use the wood cabins for firewood and began to steal remnants left behind. In 1988 the town site was threatened when a Canadian Mining Company wanted to build a large open gold mining pit on the bluff above town. Eventually in 1994 legislation passed a law not allowing mining claims to be purchased on public land and since Bodie has been saved. 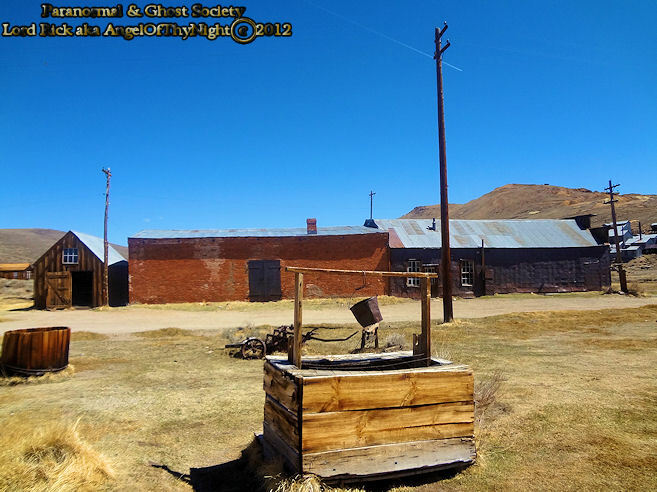 Today the ghost town is one of the largest most well preserved ghost towns in the country. It was a wild, rich and uncivilized place back in the day. All them stories you heard about bad men seemed to surround this town. Outlaws came to Bodie to find work while some of them lived their lives as thieves. Sooner or later the bad and the good were succumbed to death and buried at the cemetery that overlooks the town. A pastor claimed that the town was sitting in a"a sea of sin, lashed by the tempests of lust and passion" while children feared living here. The last newspaper to be printed here was in the year of 1912 and the post office closed along with the last mine in 1942 due to WWII which was responsible for the closing of many mines. When the mines closed the miners and their families left. 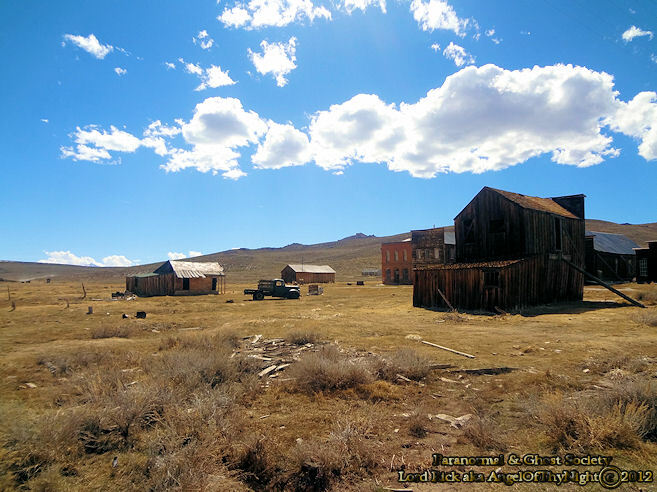 The U.S. census showed a population in Bodie of about 120 in the 1920s so you can imagine how odd it must had felt to reside here surrounded by so many abandoned homes and buildings. Allot of the ghost stories began around a century ago when the town became overly quiet and neglected! When it became a state park and rangers lived in many various homes within the town site also presented the opportunity for some ghost stories to began such as the Cain and Mendocini Houses! 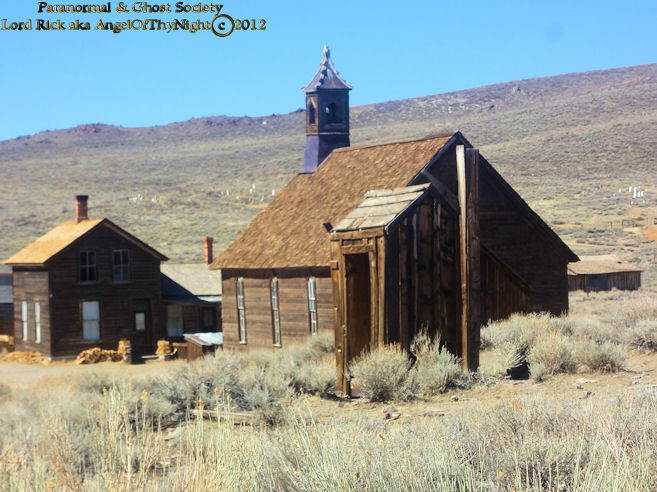 Bodie may just be the most haunted ghost town in the wild west its what most ghosthunters like myself dream about. Every corner yields some sort of history or oddity this includes possibly seeing an apparition roaming these dilapidated structures. Bodie is a true ghost town even though today most of the town has been burnt to the ground their are many sites that exist today like the Methodist Church and School House which stand out from miles away. Bodie will always hold a special place in my heart between its scenic beauty and that it was our organizations 1000th investigation. 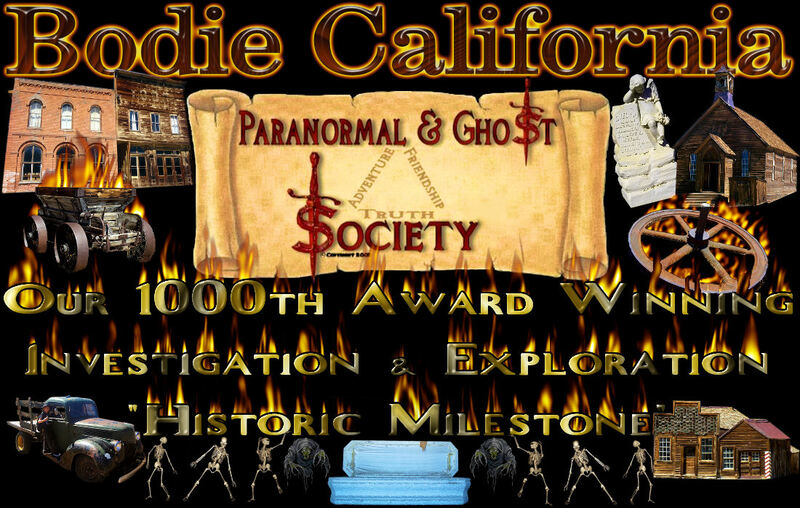 It is a milestone that really puts us in the big leagues and making us one of the greatest paranormal groups in the country. I mean when you really look at the facts Bodie has it all the history, legends, ghost tales and nearly two hundred sites to explore. What could be better? Our journey is far from over with Bodie as we will return in search where the west was wild and legends were lost! 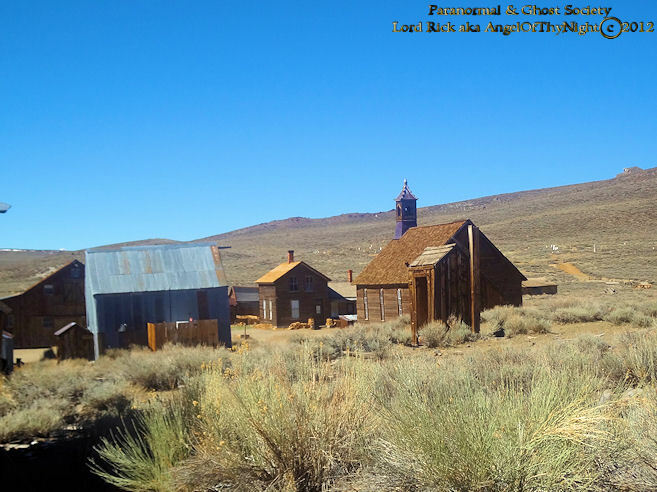 We welcome you to read further below a more in depth history of Bodie and our article on the curse of Bodie to go with our content! Bodie is a ghost town in the Bodie Hills east of the Sierra Nevada mountain range in Mono County, California, United States, about 75 miles (120 km) southeast of Lake Tahoe. It is located 12 miles (19 km) east-southeast of Bridgeport, at an elevation of 8379 feet (2554 m). As Bodie Historic District, the U.S. Department of the Interior recognizes it as a National Historic Landmark. The ghost town has been administered by California State Parks since becoming a state historic park in 1962, and receives about 200,000 visitors yearly. 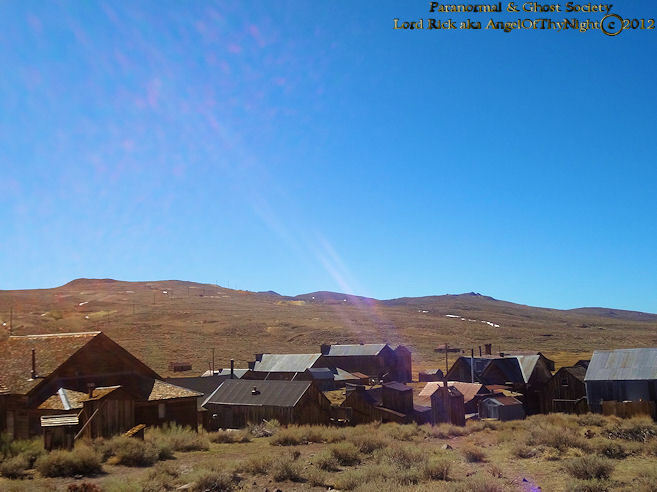 Bodie began as a mining camp of little note following the discovery of gold in 1859 by a group of prospectors, including W.S. Bodey (first name uncertain). Bodey perished in a blizzard the following November while making a supply trip to Monoville (near present day Mono City, California), never getting to see the rise of the town that was named after him. According to area pioneer, Judge J.G. 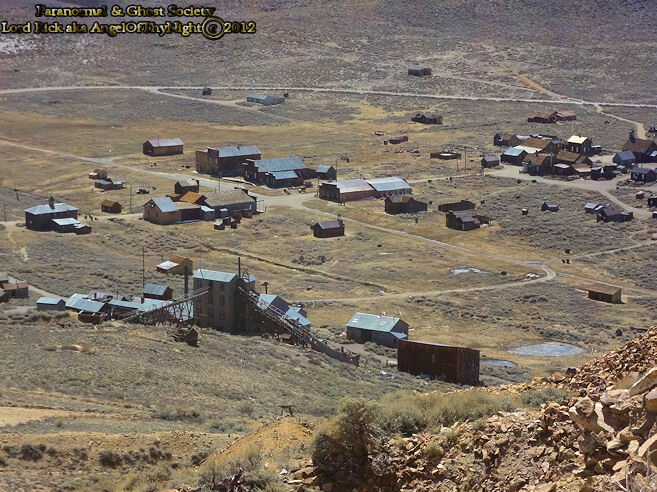 McClinton, the district's name was changed from "Bodey," "Body," and a few other phonetic variations, to "Bodie," after a painter in the nearby boomtown of Aurora, lettered a sign "Bodie Stables" Gold discovered at Bodie coincided with the discovery of silver at nearby Aurora, (thought to be in California, later found to be Nevada), and the distant Comstock Lode beneath Virginia City, Nevada. 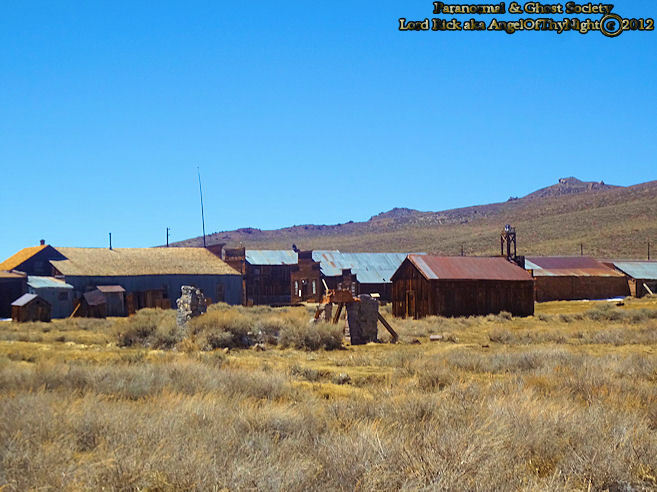 But while these two towns boomed, interest in Bodie remained lackluster. By 1868 only two companies had built stamp mills at Bodie, and both had failed. 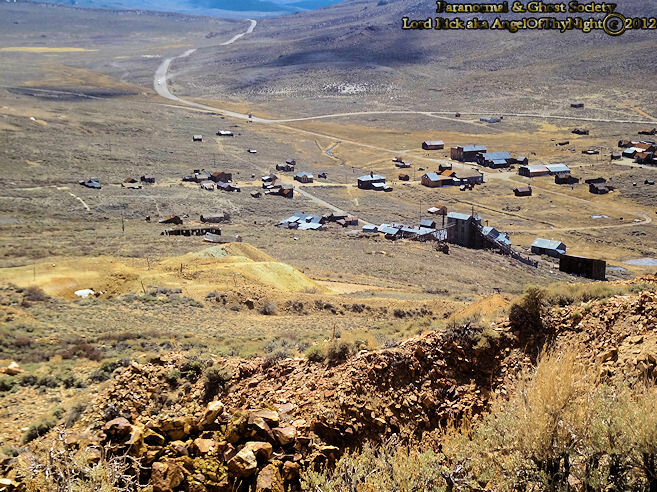 In 1876, the Standard Company discovered a profitable deposit of gold-bearing ore, which transformed Bodie from an isolated mining camp comprising a few prospectors and company employees to a Wild West boomtown. 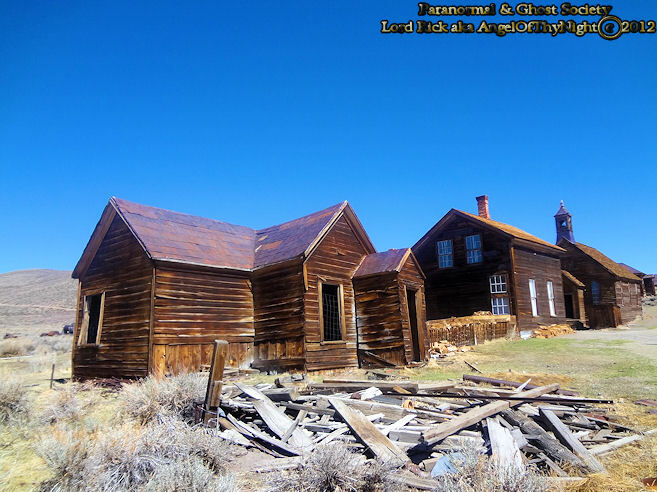 Rich discoveries in the adjacent Bodie Mine during 1878 attracted even more hopeful people. 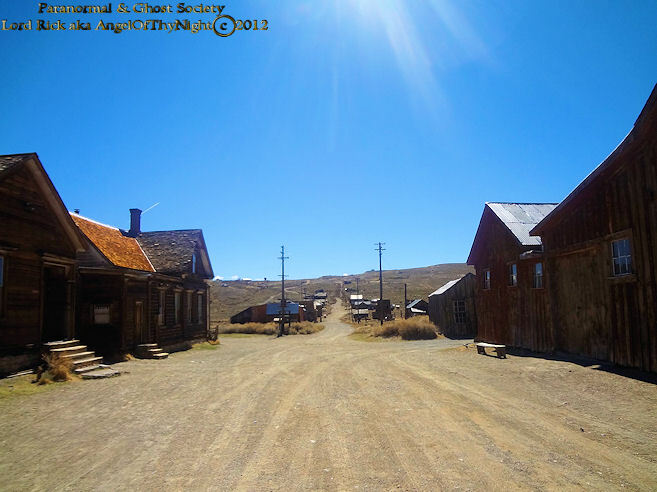 By 1879, Bodie had a population of approximately 5000–7000 people and around 2,000 buildings. 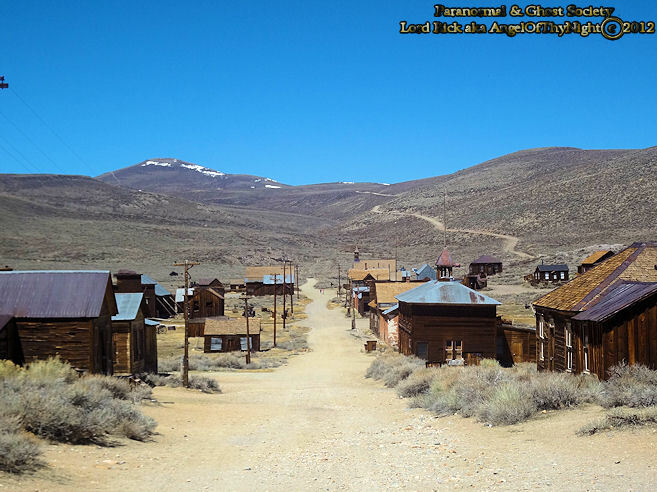 One idea maintains that in 1880, Bodie was California's second or third largest city, but the U.S. Census of that year disproves the popular tale. 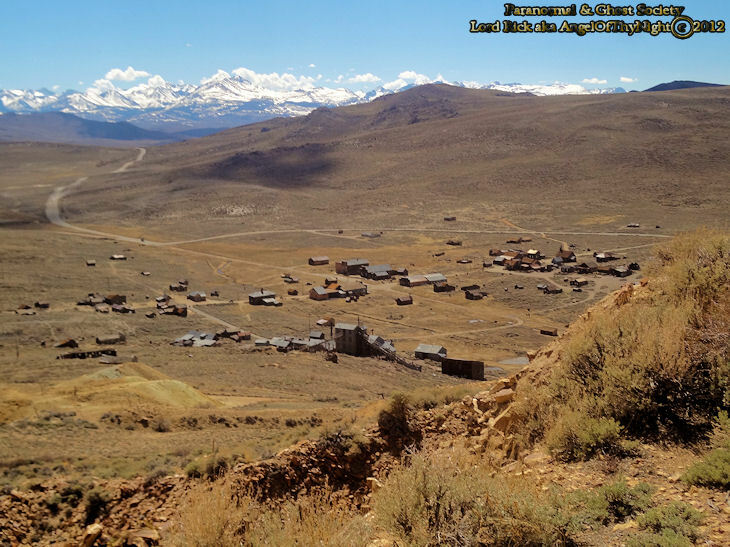 Over the years, Bodie's mines produced gold valued at nearly US$34 million. Bodie boomed from late 1877 through mid- to late 1880. The first newspaper, The Standard Pioneer Journal of Mono County, published its first edition on October 10, 1877. It started out as a weekly, but soon became a thrice-weekly paper. 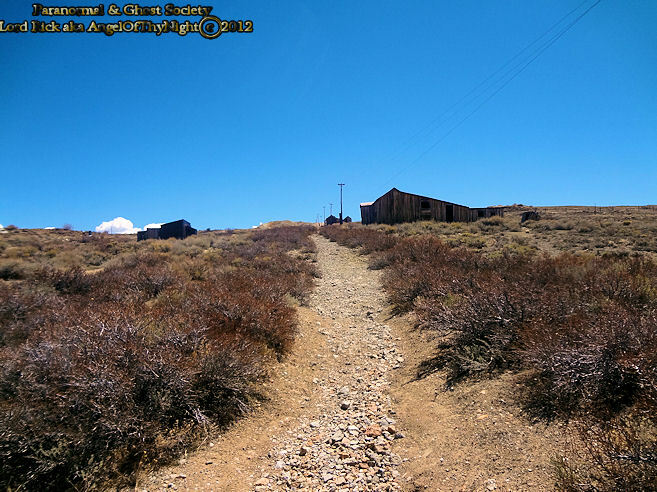 It was also during this time that a telegraph line was built which connected Bodie with Bridgeport and Genoa, Nevada. California and Nevada newspapers predicted Bodie would become the next Comstock Lode. Men from both states were lured to Bodie by the prospect of another bonanza. Gold bullion from the town's nine stamp mills was shipped to Carson City, Nevada, by way of Aurora, Wellington and Gardnerville. Most shipments were accompanied by armed guards. After the bullion reached Carson City, it was delivered to the mint there, or sent by rail to the mint in San Francisco. 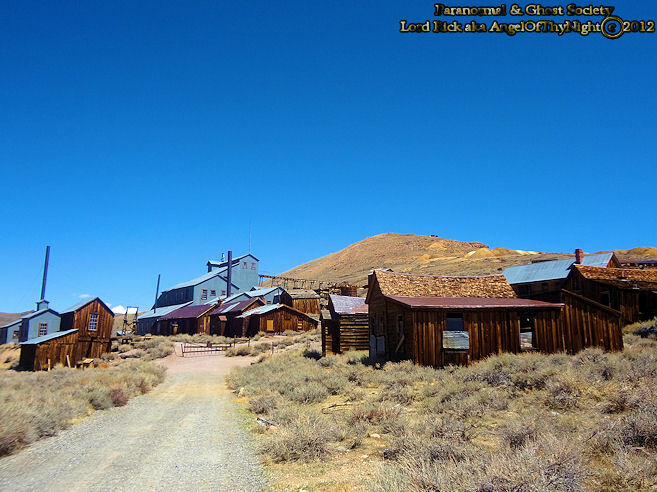 As a bustling gold mining center, Bodie had the amenities of larger towns, including a Wells Fargo Bank, four volunteer fire companies, a brass band, a railroad, miners' and mechanics' unions, several daily newspapers, and a jail. At its peak, 65 saloons lined Main Street, which was a mile long. Murders, shootouts, barroom brawls, and stagecoach holdups were regular occurrences. As with other remote mining towns, Bodie had a popular, though clandestinely important, red light district on the north end of town. From this is told the unsubstantiated story of Rosa May, a prostitute who, in the style of Florence Nightingale, came to the aid of the town menfolk when a serious epidemic struck the town at the height of its boom. She is credited with giving life-saving care to many, but was buried outside the cemetery fence. 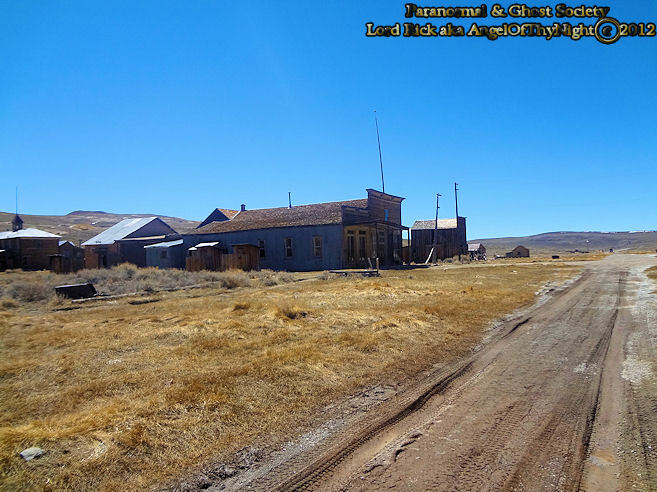 Bodie had a Chinatown, the main street of which ran at a right angle to Bodie's Main Street, with several hundred Chinese residents at one point, and included a Taoist temple. Opium dens were plentiful in this area. 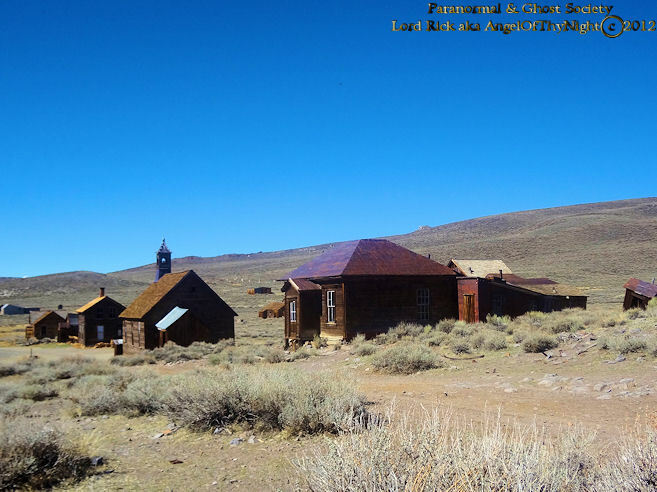 Bodie also had a cemetery on the outskirts of town and a nearby mortuary, which is the only building in the town built of red brick three courses thick, most likely for insulation to keep the air temperature steady during the cold winters and hot summers. The cemetery was Miners Union Cemetery, and includes a cenotaph to President James A. Garfield. On Main Street stands the Miners Union Hall, which was the meeting place for labor unions and an entertainment center that hosted dances, concerts, plays, and school recitals. It now serves as a museum. The first signs of decline appeared in 1880 and became obvious towards the end of the year. Promising mining booms in Butte, Montana; Tombstone, Arizona; and Utah lured men away from Bodie. 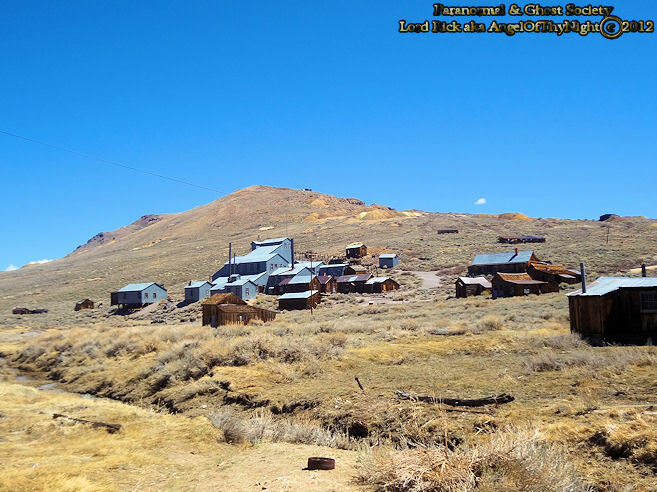 The get-rich quick, single miners who originally came to the town in the 1870s moved on to these other booms, which eventually turned Bodie into a family-oriented community. Two examples of this settling were the construction of the Methodist Church (which currently stands) and the Roman Catholic Church (burned about 1930) that were both constructed in 1882. Despite the population decline, the mines were flourishing, and in 1881 Bodie's ore production was recorded at a high of $3.1 million. Also in 1881, a narrow gauge railroad was built called the Bodie Railway & Lumber Company, bringing lumber, cordwood, and mine timbers to the mining district from Mono Mills south of Mono Lake. During the early 1890s, Bodie enjoyed a short revival seen in technological advancements in the mines that continued to support the town. In 1890, the recently invented cyanide process promised to recover gold and silver from discarded mill tailings and from low-grade ore bodies that had been passed over. In 1893, the Standard Company built its own hydroelectric plant, located approximately 12.5 miles (20.1 km) away on Green Creek, above Bridgeport, California. The plant developed a maximum of 130 horsepower (97 kW) and 6,600 volts alternating current (AC) to power the company's 20-stamp mill. This pioneering installation is marked as one of the country's first transmissions of electricity over a long distance. In 1910, the population was recorded at 698 people, which were predominantly families that decided to stay in Bodie instead of moving on to other prosperous strikes. The first signs of an official decline occurred in 1912 with the printing of the last Bodie newspaper, The Bodie Miner. In a 1913 book titled California tourist guide and handbook: authentic description of routes of travel and points of interest in California, the authors, Wells and Aubrey Drury, described Bodie as a "mining town, which is the center of a large mineral region" and provided reference to two hotels and a railroad operating there. In 1913, the Standard Consolidated Mine closed. Mining profits in 1914 were at a low of $6,821. 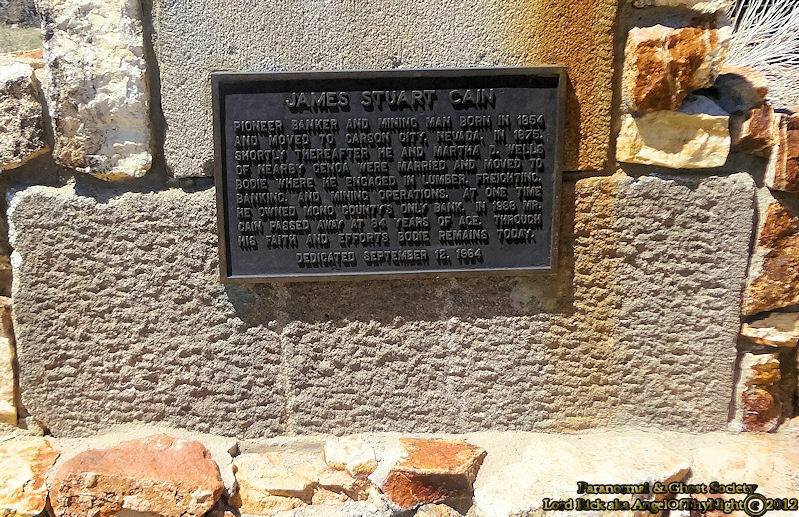 James S. Cain was buying up everything from the town lots to the mining claims, and reopened the Standard mill to former employees, which resulted in an over $100,000 profit in 1915. However, this financial growth was not in time to stop the town's decline. In 1917, the Bodie Railway was abandoned and its iron tracks were scrapped. The last mine closed in 1942, due to War Production Board order L-208, shutting down all nonessential gold mines in the United States. Mining never resumed. 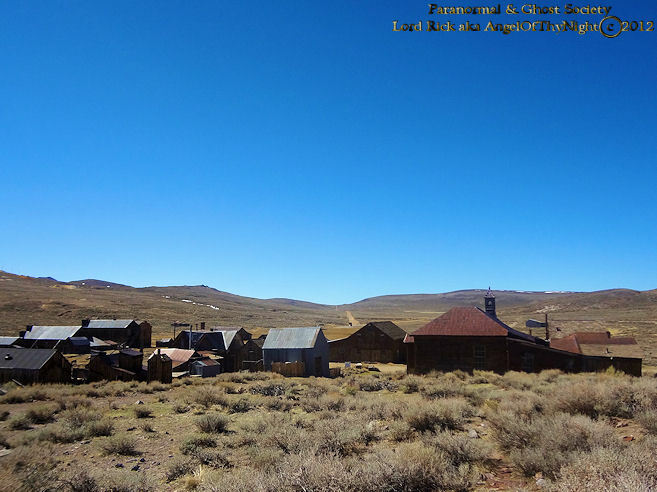 The first label of Bodie as a "ghost town" was in 1915. In a time when auto travel was on a rise, many were adventuring into Bodie via automobiles. The San Francisco Chronicle published an article in 1919 to dispute the "ghost town" label. 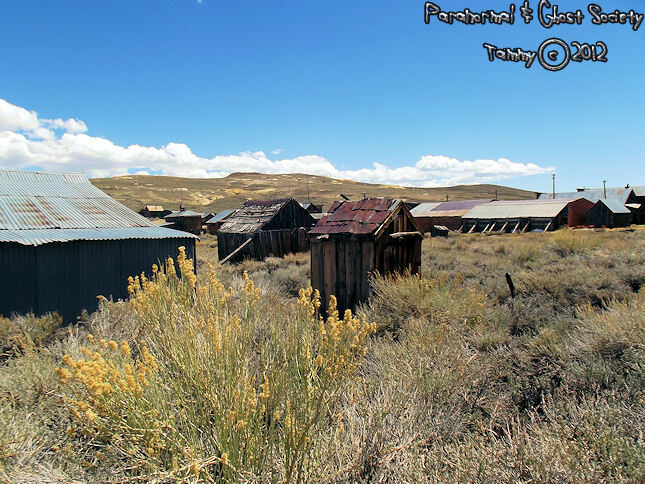 By 1920, Bodie's population was recorded by the US Federal Census at a total of 120 people. Despite the decline, Bodie had permanent residents through most of the 20th century, even after a fire ravaged much of the downtown business district in 1932. A post office operated at Bodie from 1877 to 1942. In the 1940s, the threat of vandalism faced the ghost town. The Cain family, who owned much of the land the town is situated upon, hired caretakers to protect and to maintain the town's structures. Martin Gianettoni, one of the last three people in Bodie in 1943, was also a caretaker. 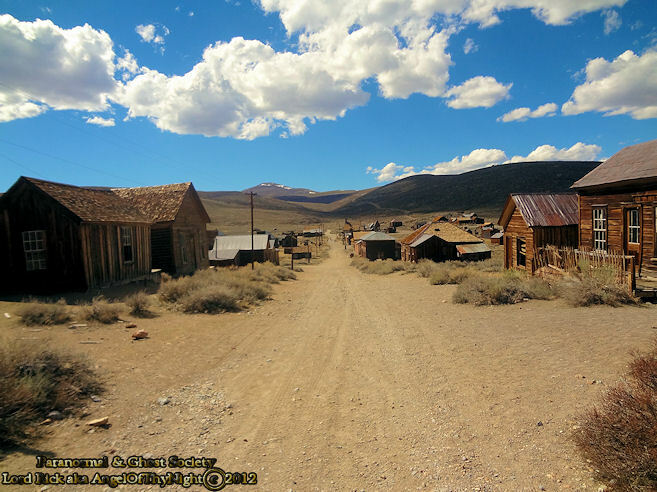 Bodie is now an authentic Wild West ghost town. 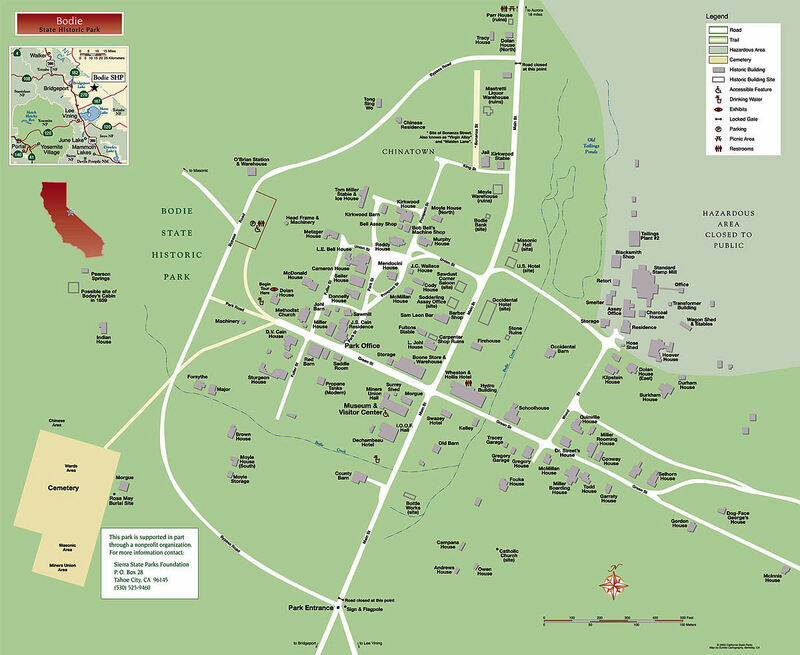 The town was designated a National Historic Landmark in 1961, and in 1962 it became Bodie State Historic Park. A total of 170 buildings remained. 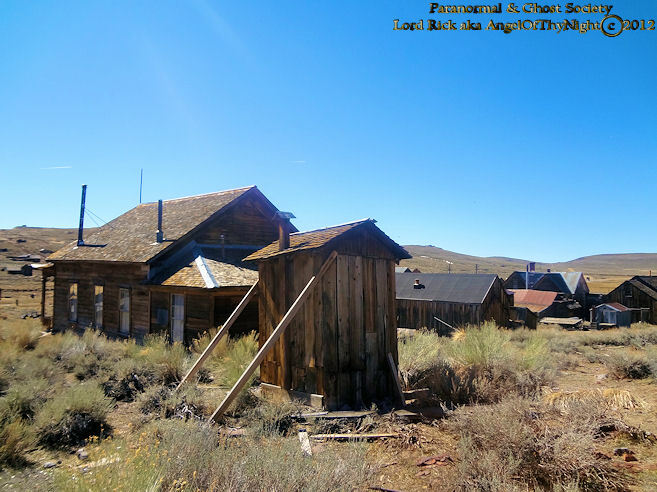 Bodie has been named California's official state gold rush ghost town. 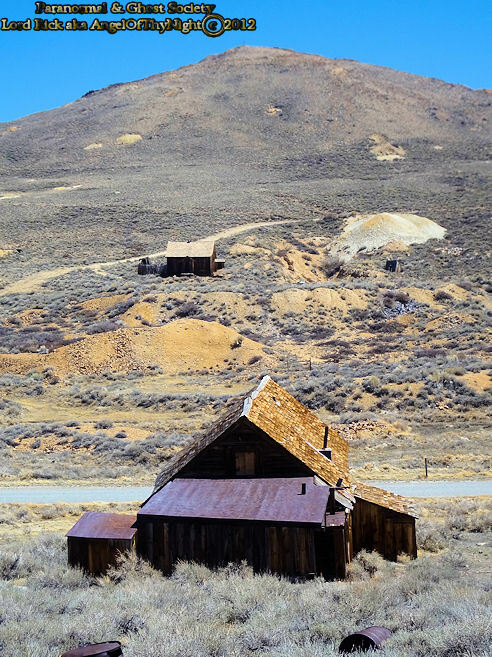 Today, Bodie is preserved in a state of arrested decay. Only a small part of the town survives. Visitors can walk the deserted streets of a town that once was a bustling area of activity. Interiors remain as they were left and stocked with goods. Bodie is open all year, but the long road that leads to the town is usually closed in the winter due to heavy snowfall, so the majority of visitors to the park come during the summer months. The California State Parks' ranger station is located in one of the original homes on Green Street. In 2009 and again in 2010, Bodie was scheduled to be closed, but the California state legislature was able to work out a budget compromise that enabled the state's Parks Closure Commission to allow it to remain open, at least during the 2009–2010 fiscal year. The park is still operating as of December 2011. Summers in Bodie are hot, and in winter, temperatures often plummet well below 0 °F (−18 °C), and winds can sweep across the valley at close to 100 miles per hour (160 km/h). Nights remain cold even through the summer, often dropping well below freezing. The harsh weather is due to a particular combination of high altitude (8,400 feet (2,600 m)) and a very exposed plateau, with little in the way of a natural surrounding wall to protect the long, flat piece of land from the elements. Plenty of firewood was needed to keep residents warm through the long winters. Bodie is not located in a forest, so lumber had to be imported from Bridgeport, California; Benton, California; Carson City, Nevada and Mono Mills, California. The winter of 1878–1879 was particularly harsh and claimed the lives of many residents. National Weather Service records show that average January temperatures in Bodie are a maximum of 39.0°F and a minimum of 5.6°F. Average July temperatures are a maximum of 76.8°F and a minimum of 35.1°F. Only three months — June, July and August — have mean monthly temperatures above 50°F. There are an average of 0.1 days with highs of 90°F (32°C) or higher and an average of 303 days with lows of 32°F (0°C) or lower. The record high temperature of 91°F was on July 21, 1988. The record low temperature of −36°F was recorded on February 13, 1903.